ARLINGTON, Texas – Sage Kimzey pointed towards his teammates on the back of the AT&T Stadium bucking chutes before emphatically pointing at the USA blazoned on his chest. Kimzey had just ridden Pure Gangster for 87.75 points Sunday in the long round of the WinStar World Casino & Resort Global Cup USA, presented by Monster Energy, to keep the Team USA Eagles in contention for the victory. Kimzey’s ride was a crucial one as the Eagles were amidst an incredible rally from three scores down on Championship Sunday to take over the lead from Brazil during the third edition of the Global Cup. His teammates were fired up too. Chase Outlaw was pounding his hands together next to Derek Kolbaba, Brennon Eldred was practically falling over the front of bucking chutes cheering Kimzey on and Cody Teel was in the back row, where his 6-foot-height benefitted him the most, jumping up and down. Eagles coach Justin McBride had his hand in the air, signaling No. 1, by the time Pure Gangster was turning into Kimzey’s hand. Minutes before he nodded for the gate, Kimzey was joking with Outlaw on the back of the bucking chutes that he would go ahead and start spurring for the Arkansas cowboy. “You damn right, you will,” Outlaw beamed. 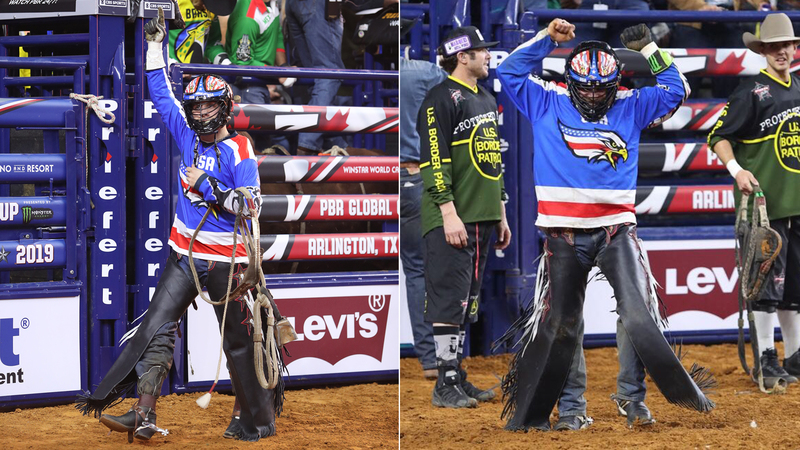 Outlaw and Kimzey were both making their Global Cup debuts for the stars and stripes, and it was clear as day the two bull riders loved being a part of the team concept. It was not too long after Kimzey’s ride that Outlaw was taking it to Skitso for 86 points to keep Team USA within two scores of Brazil. Cody Nance later put the Eagles into the lead by riding Blue Crush for 87 points. The comeback bid came up just short for the Eagles, though. Team USA went 6-for-9 on Sunday and ultimately finished one ride shy of defeating Brazil. The Eagles finished in second place with 867 points on 10 rides during the two-day competition. Kimzey had no plans on letting his teammates down once he got word that the Eagles were calling him into action. The five-time PRCA champion had missed the first night of competition in Arlington because of the Fort Worth Stock Show & Rodeo and was originally slated to only be an alternate. However, he was ready for duty when McBride called him late Saturday night to inform him world No. 1 Jess Lockwood had broken his collarbone and Kimzey was going to be suiting up for the red, white and blue on Sunday. The decision to add Kimzey to the Eagles roster to replace two-time World Champion J.B. Mauney brought about a massive debate on social media, but Kimzey wasn’t concerned. Neither was his coach, who made sure to say, ‘Great job,’ to Kimzey following his ride. In fact, every team except the Wolves rolled out their alternate at the third edition of the Global Cup. Kimzey was riding for his country first and foremost this weekend, and especially for the other seven bull riders in that locker room that were counting on him to step in once Lockwood went down. Throughout Sunday, Kimzey was right there on the back of the bucking chutes offering words of encouragement to his teammates, helping them get their riding gloves taped and giving any insight possible. It was a true team effort, and the reigning PRCA bull rider gelled just fine with the Eagles. Of course, whenever Kimzey rides at a PBR event the question that accompanies his appearance is what his future may hold. Kimzey’s goals and aspirations have not changed at this time. The Strong City, Oklahoma, bull rider is remaining committed to his ultimate goal of breaking Donnie Gay’s PRCA record of eight bull riding championships. The 24-year-old will not put a timetable on any future PBR events. “Probably not this year,” Kimzey said. “It is still the quest for nine gold buckles. Every year I am getting closer to that. All the PBR events I have been to have been great events. The people have been great. The organization has been great. Outlaw, meanwhile, will set his sights back on the PBR World Championship race. The No. 5 bull rider in the world standings trails No. 1 Lockwood, who is going to be out for the foreseeable future with a broken collarbone, by 1,225 points. The Unleash The Beast resumes with the Mason Lowe Memorial in St. Louis this coming Friday and Saturday. Fans can watch all the action from Round 1 exclusively on RidePass at 8:30 p.m. ET Friday, while CBS Sports Network will carry Round 2 at 9 p.m. ET. CBS national television will broadcast the championship round Sunday at noon ET.